I adore Shelley Castillo's digikits. Her papers are perfect for cardmaking, and this new one, Beach Comber, is just beautiful. So I made a couple of cards to showcase the papers, combining them with some digital and acrylic stamps by Hero Arts. 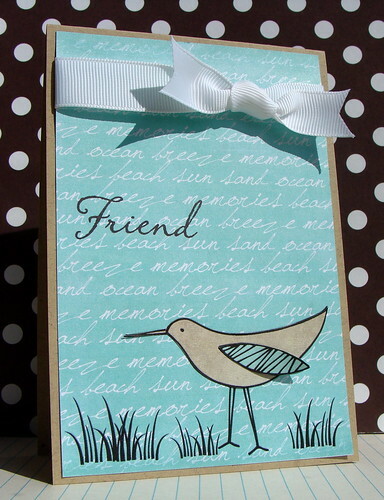 In this first card, I used the bird stamp from Beachy Fun, grass from Summer Memories and a sentiment from Just Find Me, a fab set that I just love. The ribbon is from Papertrey Ink. 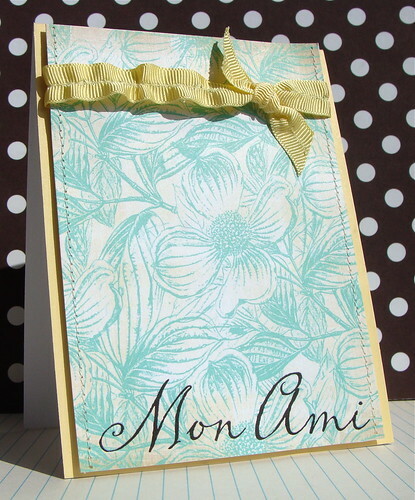 And with this one, I used a digital sentiment from Ah Paris and some gorgeous Daffodil Layering Paper. The ribbon is American Crafts. AND the first one works for your own challenge :) Love them both, the aqua papers are so fun! Beautiful cards, as always, Lucy! I love the freshness of aqua...one of my favourite colours. Happy Friday! These cards are both masterpieces! I love the aqua! And I agree- that would be awesome wallpaper! Love your hybrids! You always have the perfect composition of image and sentiment...Enjoy your weekend! lovely summery card, Lucy!! have a wonderful weekend! These are beautiful Lucy - almost as pretty as the one I GOT IN THE MAIL today!!!!!! Wahoo!!! I think I was as excited to get your gorgeous card as I was to get your FABULOUS blog candy! Wowzers, girl - I love it! There is no place within a couple hours drive to buy Hero Arts where I live, so girl, you made my day sparkle like crazy! I'm going to post about it later tonight! Thank you so very much - big, ginormous hugs! You didn't put a return address on there, so I can't mail you a thank you :( HUGS!!!!! Thank you!!!!! Simply amazing, Lucy! Love those beach-y colors! These are both beautiful, I particularly LOVE the first one, that digi paper is fabulous!! Love the blue!! These are so pretty, Lucy!